All the most iconic New Orleans sites and attractions in one mind-blowing day! This essential New Orleans landmark exudes vibrant culture and history, being the oldest neighborhood in all of New Orleans. The city itself was established in 1718, founded by Jean Baptiste Le Mayre de Bienville, and blossomed around this central square, known today as Jackson Square. Noted by locals and all who have visited the Big Easy must-see, this is a place where your group can see a tapestry painted vividly with rich history, diverse architecture, renowned culture-filled jazz clubs, fine art galleries, a lively nightlife, entertaining street performers, and some of the absolute best Cajun and Creole southern foods! While here be sure to save plenty of time to take it all in, eat all the yummy creations you can, take a historic southern tour, and see all the lively Bourbon Street entertainment available to you. The Audubon Aquarium features a walk-through tunnel and interactive experiences with the animals. Touch the stingrays, feed the birds, and watch the sharks being fed through the 400,000-gallon tank at the Gulf of Mexico exhibit. Visit the penguins, the Amazon Rain Forest, or the rescue program as they rehabilitate injured marine animals to release back into the wild. WThis Roman Catholic structure is one of the oldest U.S. cathedrals still in use and provides members of the faith and wandering travelers alike with some of the most absolutely stunning architecture in the city and a glimpse into the Catholic Church. This establishment houses the current Archdiocese of New Orleans as well as some seriously stunning Renaissance and Spanish Colonial architecture, and design features exclusive only to grand spired 1700s style churches like this one. This minor basilica will amaze your group with the beauty of its stained glass, painted ceilings, and active local congregation. This park is located in the historic French Quarter, the area first recognized as a National Historic Landmark in 1960. Jackson Square has played a vital role in the city's history, with roots tracing all the way back to the area's role in the 1803 Louisianna Purchase (though the park itself dates back even further to 1721).Considered to be one of 'America's Great Public Spaces,' Jackson Square is surrounded by several streets and sidewalks lined with Southern history and charm. 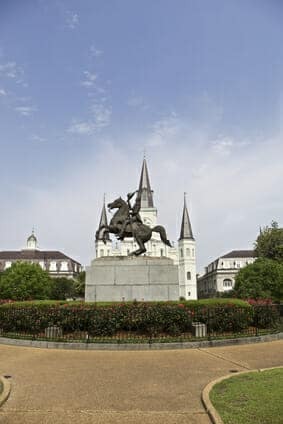 The centerpiece of the park, the statue of Andrew Jackson himself, represents the Battle of New Orleans hero and is known as one of the most historic landmarks in the entire state.Closeby you will see the St. Louis Cathedral, various state museums and historic buildings, modern residences, and several different artists galleries. There is of course, plenty of eateries as well, and great views of the Mississippi River and park green space in general, the land spanning just over 2.5 acres in this park. It will be really easy to see why over 2 million tourists and locals visit here each year after your visit!